News of another price drop arrives from Camper & Nicholsons as Jeremy Comport sees a price reduction of €600,000 on his central listing, the 26.28m motor yacht La Cima II. 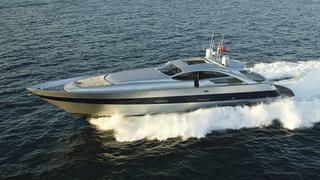 A Pershing 88 yacht, she was styled by Fulvio De Simoni and built in 2004 to RINA class. Her owner insisted on a demanding specifications list to ensure that this sports yacht wouldn’t compromise the comfort and fun of all on board and La Cima II has been meticulously maintained since new by this same owner. Accommodation is for eight guests in a master suite, VIP stateroom and two twin cabins while twin 2000hp MTU engines power her to a cruising speed of 36 knots and a maximum speed of 44 knots. Previously priced at €2.595 million, La Cima II is now asking €1.995 million.